SCOTTSDALE, AZ – This month the industry was faced with two separate but related eye-opening reminders. On April 6, 2019 the industry lost another veteran member of our family in a heartbreaking accident on the Coachella festival site. Less than a week later, an inquest into the 2012 stage roof collapse in Toronto that killed another member of our family returned 27 recommendations that, had they been in place, might have helped break the chain of causation in both events. An organization’s disregard of reasonable safety conduct or discouraging the pursuit of workplace safety training is a gross dereliction of professional and moral responsibility and must no longer be tolerated. Those who knowingly choose to ignore the collective progress of our industry’s safety culture, written guidance’s and the well-being of workers and audience should be viewed as actively choosing to be UNSAFE and treated as such by event organizers, vendors, and professionals. Enact an escalating disciplinary policy governing the use of personal protective equipment (PPE) while on site. This may include, but should not be limited to, wearing OSHA- approved hard hats while overhead work is being performed, wearing high-visibility apparel while working in or around powered industrial trucks or other vehicles, and wearing protective footwear, gloves and eye protection during load-in and load-out. ESA believes the time is long overdue for a zero-tolerance mindset regarding safety, and that those who follow the principle of LIFE SAFETY FIRST will be the most sought after individuals and providers in the business. Since ESA’s inception following the 2011 Indiana State Fair stage roof collapse, we have enjoyed the support of thousands within our community. Working alongside other groups and agencies focused on safety at live events, the Event Safety Alliance has developed, promoted and made available safety initiatives and guidances with the potential to create lasting change. It is beyond time now for everyone to earnestly put these principles to action in a rapid, visible, and uncompromising commitment. 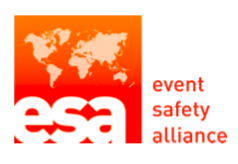 About Event Safety Alliance: Event Safety Alliance (ESA) is a 501(c)(6) non-profit trade organization dedicated to promoting and supporting “life safety first” during all phases of live event production. Through the dissemination of preparedness information, the development of planning & training resources, and the creation of online and classroom-based educational opportunities, the Event Safety Alliance strives to eliminate knowledge and awareness barriers that often contribute to unsafe conditions and behaviors.